Three arches under Maidenhead High Street. 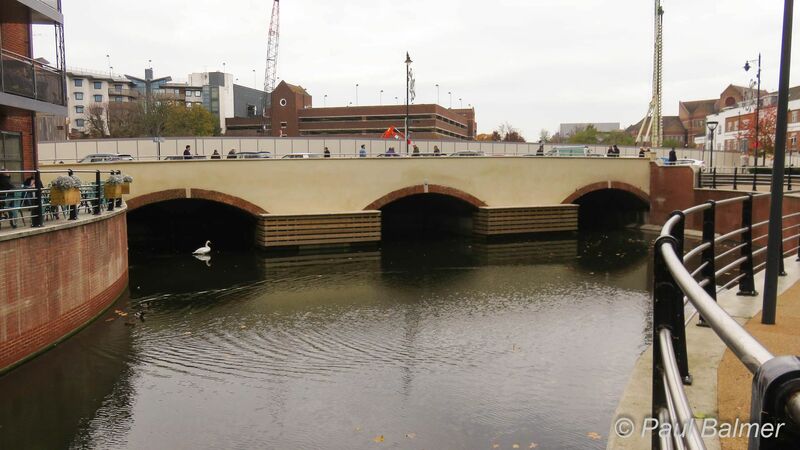 Maidenhead High Street passes over the York Stream on a three arched bridge. The left hand two arches are blind – that is they are blocked off part way through. Only the right hand arch is navigable although the difficult approach will restrict the length of boats which will fit through. The water is very shallow. If the proposed weir and lock are constructed further downstream to raise the water level to a navigable depth it will severely restrict the headroom under the bridge and provide another constraint on the size of craft which are able to navigate along the York Stream.